Home Lifestyle How Well Does My Mum Really Know Me? 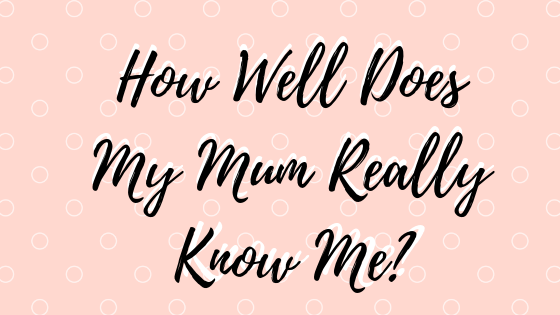 My mum likes to think that she knows everything and anything about me so today, I've put together a little test for her to see how much she actually knows. I'm really intrigued to see how this is going to go so let's begin, how well does my mum really know me? 1. When I was a child, what did I want to be when I grew up? "Teacher" - Correct. I'm not sure why I wanted to be a teacher so badly although I do think that it's just one of those generic jobs that children say they want to be. I can safely say now that I would never be a teacher. 2. What's my least favourite house work task? "Hoovering because it involves you moving around" - She thinks she's hilarious. However, she is correct. I have recently become a bit obsessed with cleaning (don't ask) but I absolutely can not stand hoovering. 3. What is something that I consider myself naturally talented at? "Make up, interior design and writing" - Oh mother, you flatter me. I would say that this is correct as these are my main hobbies but I don't want to sound pretentious and say that I'm naturally talented at them. 4. What is my favourite colour? "Orange" - I'm not sure why she said this when everything that I own is pink so my favourite colour is quite evidently pink. However, orange was my favourite colour when I was going through this whole boho phase so I guess that deserves half a point. 5. What is my favourite food? "Pizza, chicken burgers... I don't know" - Incorrect. My favourite is actually Indian food which she obviously realised after I told her. 6. What do I normally do in my free time? "Writing." - Correct. Even when I'm not doing work, I'm usually writing something or planning out some new content. It's basically all I do. 7. What do I like to drink when I go out at night? "Vodka" - At the moment, this is incorrect as I have been converted to pink gin and lemonade. However, I will give half a point for this because vodka with orange juice was my go to drink for years. 8. What brand of deodorant do I like best? "Mitchum" - Correct. Not really sure what else I can say about this, it's just deodorant really but it's definitely the best one that I've tried. 9. Do I normally finish things as soon as possible or leave them until the last minute? "Leave things until the last minute, you are a procrastinator" - Unfortunately, this is the truth. Some things, I manage to do as soon as possible but a lot of the time, I end up leaving things until the last minute and I'm not entirely sure why. Should probably sort that out. 10. What was my least favourite thing about my childhood? "School." - This is correct. The education system definitely didn't work for me for pretty much the entirety of my time at primary and secondary school and I'm very much glad to be at University now where I have more freedom but also, more support when I need it. 8/10. Not bad. Does my mum really know me? I would say she does! Do you enjoy this sort of post? Let me know! Not bad at all! I wonder how my mom would do! I would love to see other people's mums answering these! This is so fun, I'd love to do this with my mum!